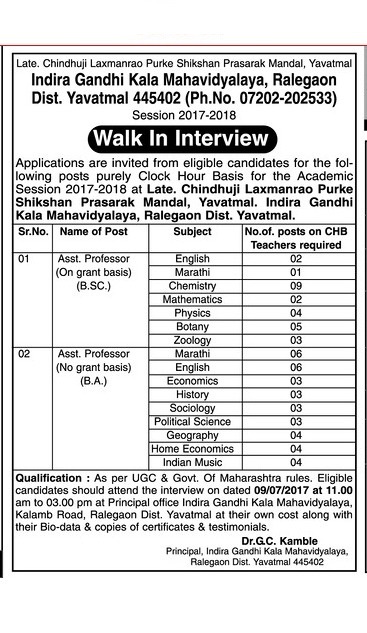 Indira Gandhi Kala Mahavidyalaya (Indira Gandhi Kala Mahavidyalaya Ralegaon), Yavatmal Published Job Notification for 62 Teacher Posts. Candidates who wish to apply must look at Indira Gandhi Kala Mahavidyalaya Teacher Recruitment 2017. Eligible candidates can apply online / offline before 09-07-2017 (09th July 2017). Education Qualification: Must have Post Graduation degree. For Post wise Education Details follow the detailed advertisement. Interested & Eligible candidates may attend for walk in interview along with all the documents addressed at Principal office Indira Gandhi Kala Mahavidyalaya, Kalamb Road, Ralegaon Dist. Yavtamal. Starting Date, Last Date to Apply Offline at Indira Gandhi Kala Mahavidyalaya Ralegaon which candidates should be remember as follows.